Mardi Himal Trek | Adam Tours & Travel Pvt. Ltd.
Mardi Himal trek is less traveled route in Annapurna region. It is best to experience the brilliance of solitary ever snow capped peaks and great opportunity of an excellent cultural experience and venture of Machhapuchhare Base camp. The exotic and interesting trail wanders through lush valleys, alpine meadows, lichen-laden dense forests, numerous streams and waterfalls, all the while the fascinating mountain sceneries glossy upon the close horizon. The path is so less used and non touristy that you feel like embarking upon a discovery expedition. the trail starts from the very beautiful city Pohkara having chance to boat in Phewa Lake and enjoy spectacular views. The trail goes through the pine, Juniper and rhododendron dense forest with raging rivers making sound then different route takes us steeply down to the upper Mardi Khola. The stream has been the ice and the snow of the Mardi Himal. The trail follows through the lovely rice terrace, unique culture villages and spectacular views of livery mountains.. The journey of Mardi Himal Trekking ascends through the forest and actuality wildlife. 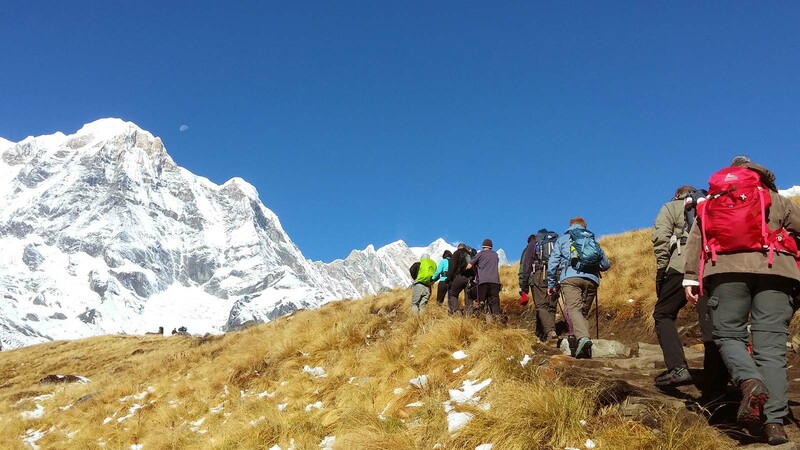 Mardi Himal trekking offers superb Himalayan scenery including the Mt. Dhauglagiri, Mt. Annapurna Ranges, Mt. Hiunchuli, Mt. Fish tail (Machhapuchhare) etc. hiking on this route will give you a great place to get a taste of the real thing if you are light on alpine experience. The climbing trip can be combined with a trekking adventure in the remote steep-sided valleys heavily wooded with bamboo and rhododendron. Above the forest high alpine pastures provide good grazing and undisturbed habitat for wildlife. It prominence on the wilderness zone of mountains designed to provide outstanding mountain views, and to get away from the tea-house trails and into the forests and villages that have not felt the impact of tourism. Day 11: Pokhara to Kathmandu, Take a 25 minutes flight or 6/7 hour Drive. We will meet you at airport and transfer to your hotel. As you freshen up after your long journey, you will be asked to visit our office for a briefing about your program. You will have meeting with your trekking guide and discuss about the equipment needed for the trekking and we will process for the trekking permits. If you arrive at night we will have same discussion in next day morning after your breakfast. After having your breakfast, we will drive you to the Domestic Airport to take a 25 minutes flight to Pokhara. Or if you wish you can take a Tourist bus to Pokhara about 6-7 hour drive exploring & enjoying with scenic beauty all the way around. In the evening, a boating trip on Phewa Lake will be followed where you can enjoy the spectacular views of Annapurna Himalaya Range reflected in all it’s glory in the calm green water of the lake. Take a 30min drive to roadside shacks of Phedi. The start of the trail heads up the hill on a set of steps across the road. The main part of Dhampus valley is on the top of the ridge, more than 500m above. The area is inhabited by Brahmins, Chhetris and few Gurungs. Crossing the dirt road a couple of times and stone staircases makes the trail more adventuring. The spectacular panoramic view of Annapurna Himalayan range makes your overnight camping much greater. It’s a total of 6 hours work today. The trek enters an enchanted forest of birch, giant rhododendron, mountain oak, maple, hemlock, and daphnia. The overnight camping here enjoys relaxation after a long tough but adventuring trail. As we climb, the flora has turned to classic ‘cloud forest’ with mosses and lichen, tree ferns and orchids hosted by the hardier trees. There are windows in the woods that look out onto the thrilling panorama – close up dramatic scenery of sacred Mt. Machhapuchhare, Mardi Himal and Annapurna chains. We have our early breakfast and start trekking to reach our highest point of the trek. If conditions are favorable we will climb up to 15,000/16,000 ft. The great ice fields and the blue glaciers of the Annapurna sanctuary walls lie below us. The view we capture today will be never forgotten. We will return to our camp in the evening. Today will be our rest day as we hike a lot on the previous day. Also you can make a short hiking over around viewing and have an essence of discovery expedition. After breakfast, today journey start an unhurried descent through the shade of the forest and out on to the terraced fields, down 1600m. This is a different route down to the upper Mardi Khola. Here, as we make our way along the banks of the Mardi Khola from the hill-side village of Siding, down through the lovely fields, passing the simple farms and over the interesting suspension bridges. There is no doubt that this is indeed the idyllic Nepal Countryside. Overnight at camp. After a short walk now the trail skirts an outcrop- there’s the road and transport. We will be back to Pokhara by the lunch. You’re free here to feel the moderate climate and sceneries of this Magic land or Dream Land of Nepal. Explore the various interesting places like Mahendra Cave, David’s fall and the various lakes of course. Day 11:Pokhara to Kathmandu, Take a 25 minutes flight or 6/7 hour Drive. You can take a flight or drive by tourist bus/Private car to Kathmandu. At the evening you can have your last night in Nepal enjoying the Nepali cultural dinner show, taking some beautiful snaps and making up your mind for the returning journey. You can have a greetings exchanging among friends and with all Nepalese people. We will take you to the International Airport with due respect Wish you a happy journey back to our home and hope to see you again. (The above itinerary can be tailor made as per clients request, we can make the itinerary more shorter by cutting day 02 city tour, there is early morning 8 am flight to Pokhara which is only 25 minutes flight so we can start the trek in same day, can take a fly back also late afternoon, So people have short time wanted to do this trek also possible, people who have longer time can add the White Water Rafting, Jungle safari tour in Chitwan National park, can spend more time in Pokhara by doing Paragliding, Zeep Flyer and other extra activities so feel free to write us your interest and time and we will make the itinerary to suites your needs). Adam Travel Trekking have made every effort to keep our price as competitive as possible, by still providing an excelling service to our customer. We pay our porters and guide the legal wages agreed with the porters union, our trekking staffs are some of the best paid in Nepal which allow us to attract only the best guides and porters and we have same amount of Insurance for guide and porter which is more than Government fixed amount. All our price are net and there are no hidden cost everything is clear on cost includes and excludes this is the main reason all our customer are happy from our service. For up to date cost for the trip please contact us. Hotel Accommodation in Kathmandu on a twin sharing basis including breakfast. Hotel Accommodation in Pokhara on a twin sharing basis including breakfast. Annapurna Conservation Area Trekking Permit. Lunch and dinner in Kathmandu & Pokhara. Best Travel Time: February to Mid June, September – November are the best seasons. Dec & January are Winter and cold can be snow on the trail, July & August are rainy time, trekking can be done but visibility can be poor due to rain. Departure Dates: We are able to offer this trek on any dates during the months Feb, March, April, May, June, Sept, Oct, November and December for a group of 1 to 12 people. Transportation: Tourist Bus, Private Car/Van,Plane.